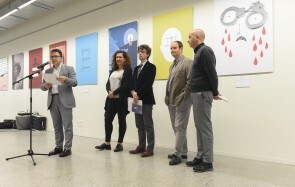 The 16th Human Rights Film Festival takes in the exhibition Insights into human rights, that will be open at the Carlos Santamaría Center (UPV/EHU – Gipuzkoa Campus) between April 16th and May 18th. Thirty professional designers have been brought together in a group project, each depicting their "perspectives" on human rights. Marking the 70th anniversary of the adoption of the Universal Declaration of Human Rights on December 10th, the artists have used their sensitivity to interpret and express in poster form each of the declaration's human rights. Curated by Leire Fernández Iñurritegui and Eduardo Herrera (lecturers at UPV/EHU), the exhibit is a project that came from a social committment of the University of the Basque Country (UPV/EHU), to help us understand human rights through design.